This stunning ring has a beautiful half carat diamond in a classic claw-setting. Crafted in luxurious 18ct gold with scroll detail, this is the perfect engagement ring for the traditional woman. 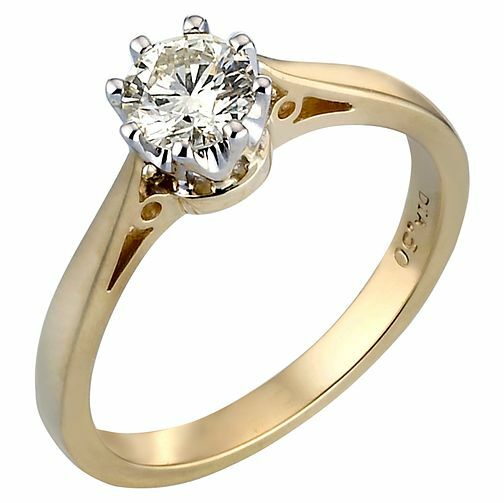 18ct Gold Half Carat Diamond Solitaire Ring is rated 5.0 out of 5 by 9. Rated 5 out of 5 by Anonymous from Beautiful classic solitaire ring I’d been looking for the perfect engagement ring for awhile now. I was struggling to find a classic yet beautiful ring. I saw this one online and went into store to see it in real life and loved it. It’s a very reasonable sized diamond and the band isn’t thin it feels sturdy. Rated 5 out of 5 by Anonymous from She said YES! Bought this to propose and was really impressed lovely sized diamond and beautiful design. She thought the same when she see it and loved it.